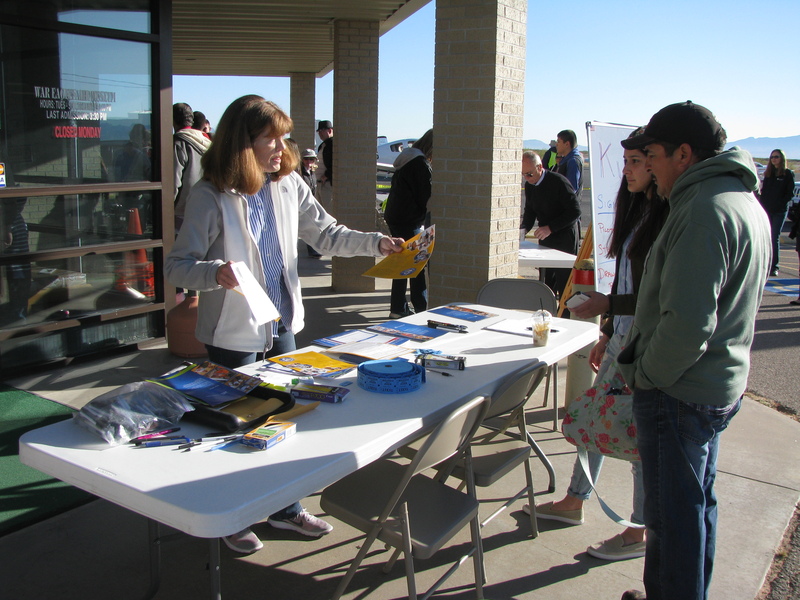 FASF Member Melissa Keithly (2nd from Right), wife of EAA Chapter 1570 President, John Keithly, registering Young Eagles and Parents for their Flight Experience. NOTE: All photos in this story can be seen in full high resolution by merely clicking anywhere on their surface, but you’ll need to click your browser back to return to the article. 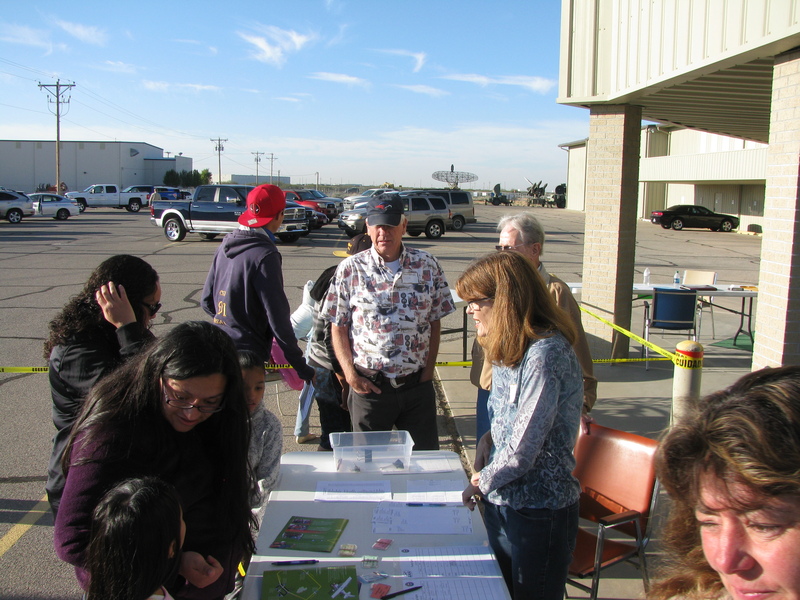 Photos thanks to EAA Chapter 1570. 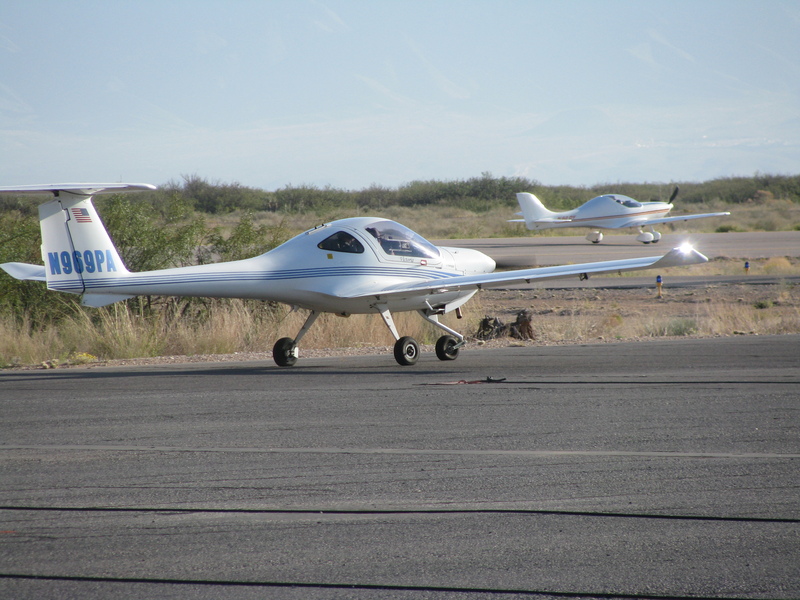 The YOUNG EAGLES project was started in 1992 by the Experimental Aircraft Association (“EAA“). The EAA is based in Oshkosh, Wisconsin, but has almost 1,000 chapters world-wide. Back in 1992, the EAA saw the need for a steady stream of new pilots for both civilian as well as for military aviation. Even in the early 90’s, the supply of pilots was beginning to fall short of demand, so the EAA came up with the novel idea of aggressively introducing more young people to the adventure, challenges and rewards of becoming an aviator. This year the EAA will celebrate of the 25th anniversary of this highly successful program. 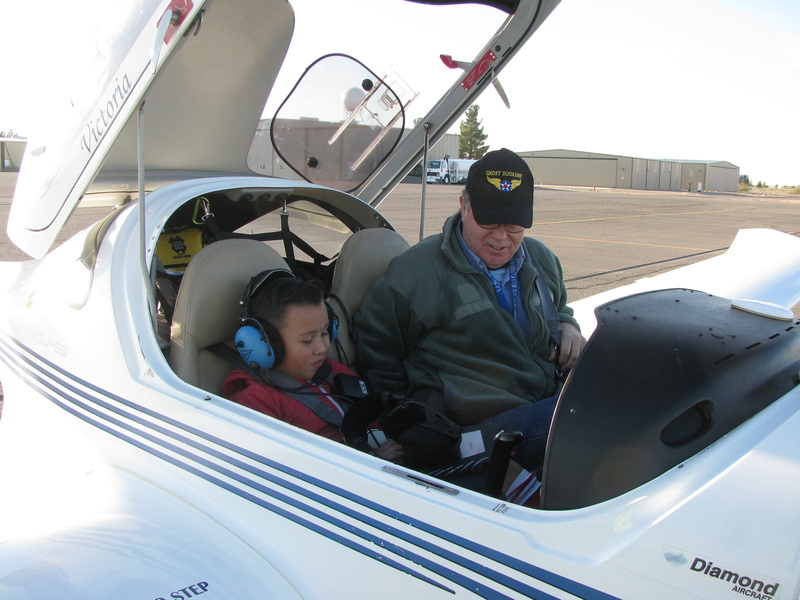 If you have children or grandchildren between the ages of 8 and 17 (or even know of someone else who does), you might want to encourage them to enjoy the thrill of flying in a plane they can actually help fly – which is just what is in store for them if they participate with the Young Eagles. Your webmaster has personally witnessed the excitement of this program in action and marveled at the broad smiles and enthusiasm on the young people’s faces, when they come down after their initial flights. 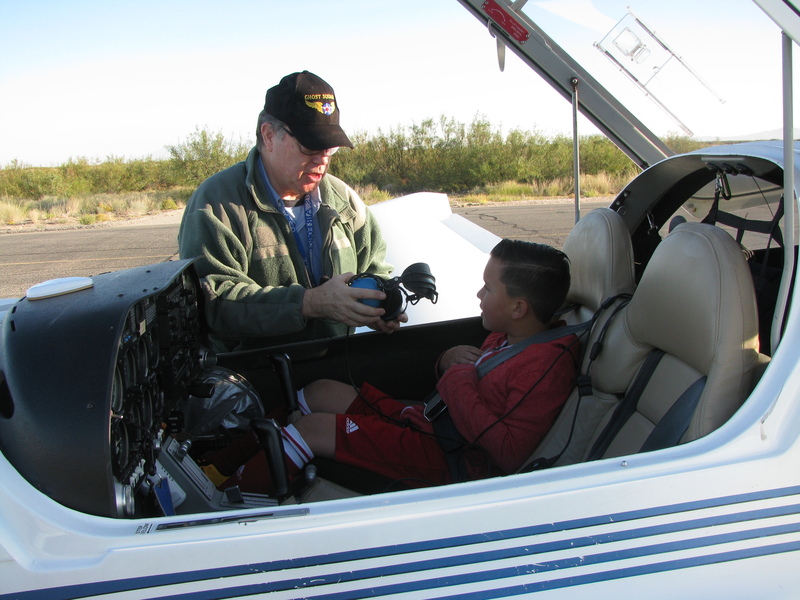 These new Young Eagles obviously realize how lucky they are to have parents willing to provide them with this unusual – and inspiring – first-hand aviation experience. Keep in mind that the Young Eagles flight experience is gratis. There is no charge for these flights. 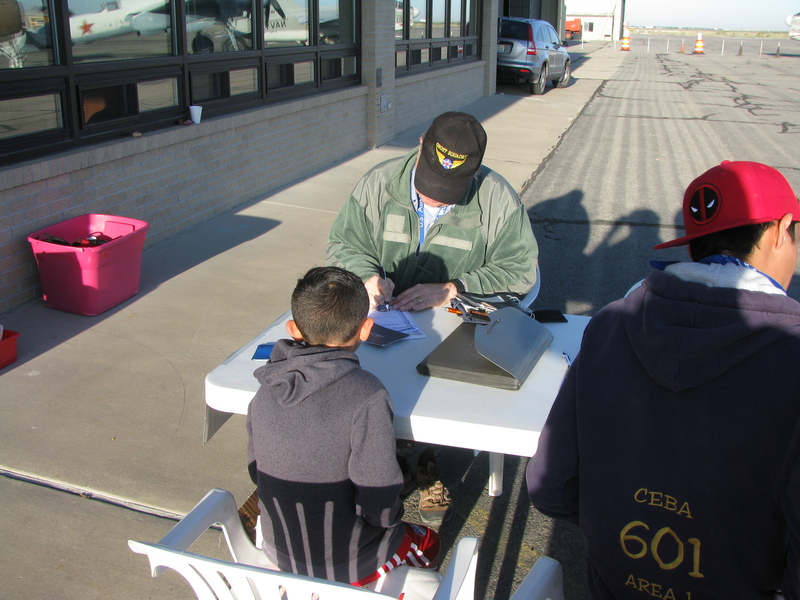 The EAA Volunteer members supply their airplanes without cost to the participants or their parents. 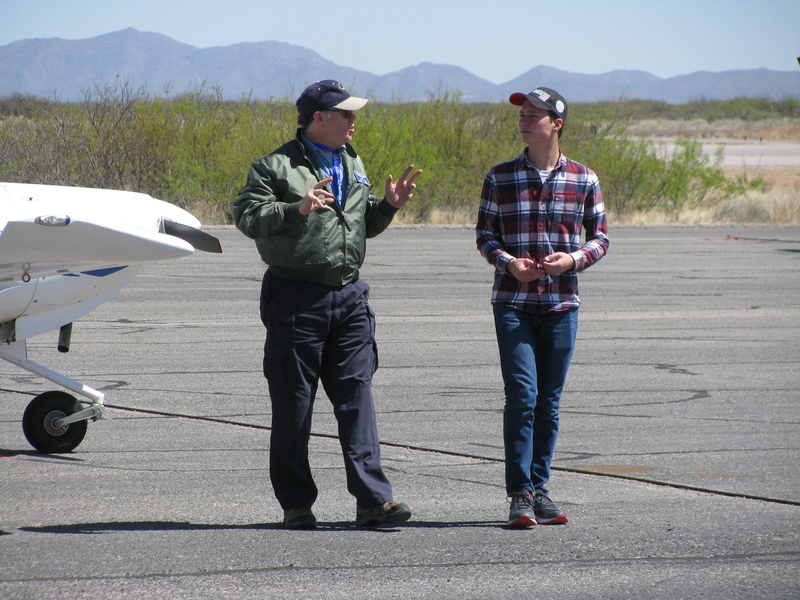 To learn the details of this program, just check the EAA headquarters’ website right here to find the chapter closest to you, and then contact that nearby chapter to find out when they will be holding their next Young Eagles adventure. 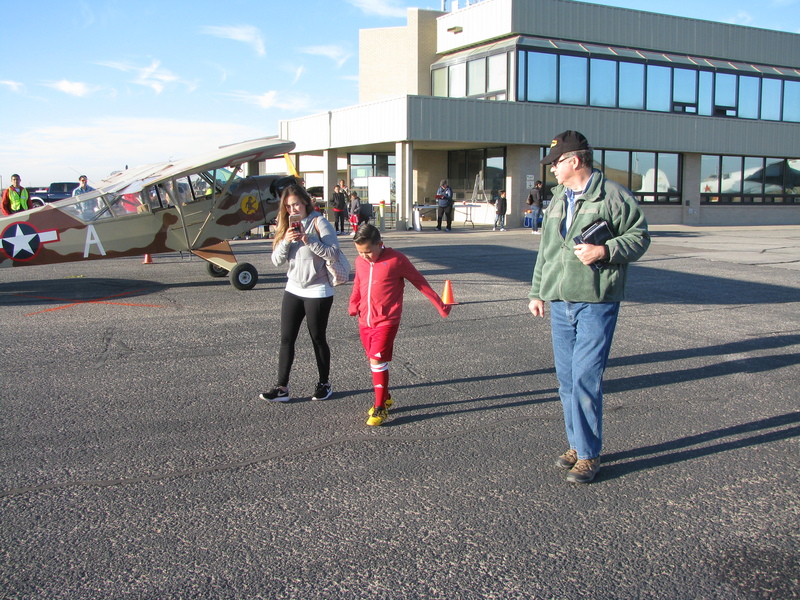 Again, member pilots in each chapter of the EAA contribute both their own airplanes and their time to help introduce the children to the excitement of flying in a small General Aviation (“GA”) airplane. 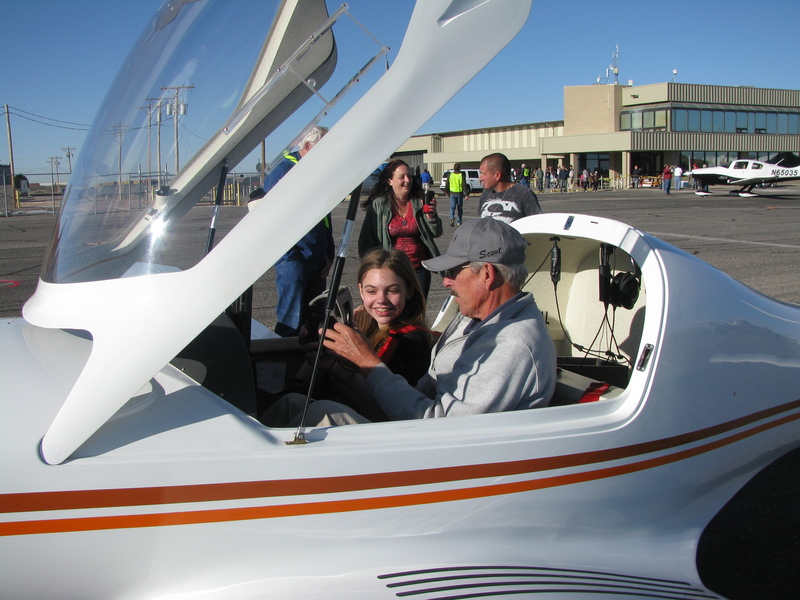 Many Boy and Girl Scout Troops around the country actively encourage their Scouts to take part in this aviation experience, but no scouting affiliation is required to sign-up for the Young Eagle familiarization flights. The two nearest chapters to the FASF Headquarters here in Columbus, NM, are the outstanding and highly accomplished EAA 555 Chapter in Las Cruces, NM, which can be contacted at 575.520.0451, where FASF member, Wes Baker, is the President. One of the oldest members of Chapter 555 is the well known astronaut, Frank Borman. Chapter 555 is a member of the FASF, and some of its members are among the FASF’s most active volunteers. 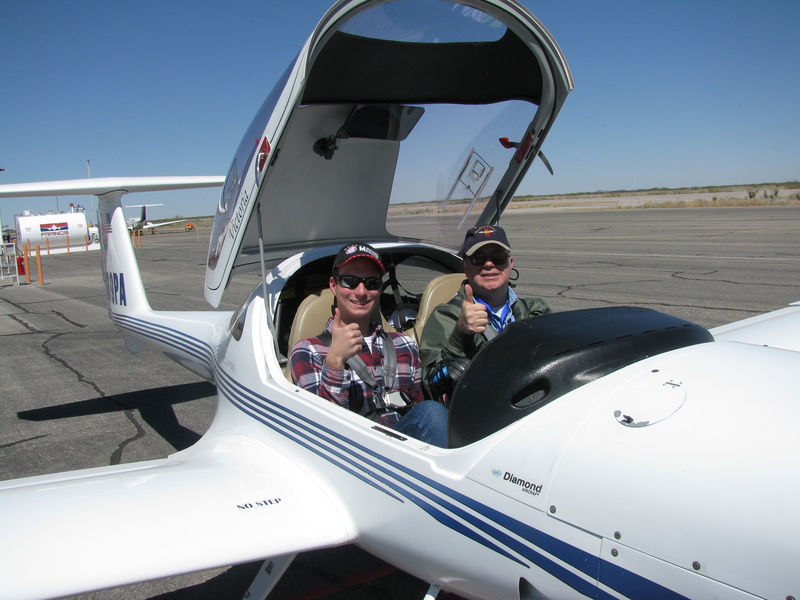 The EAA’s International Chapters Manager is a long time chapter 555 member – Brett Hahn. Brett is also active member of the FASF. One of the EAA’s newest chapters, number 1570, is located adjacent to El Paso, TX, in Santa Teresa, NM, at the Dona Ana County Jetport. The 1570 President is John Keithly. 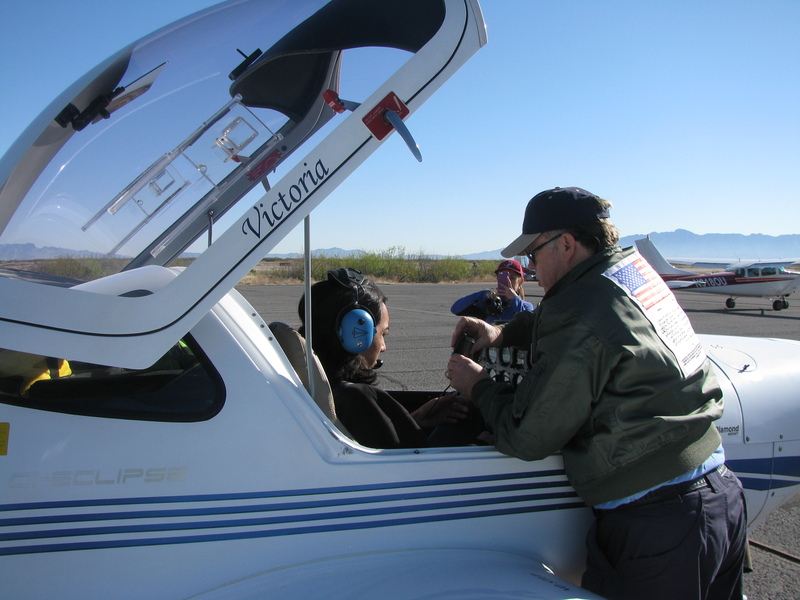 The best phone number for the Santa Teresa Chapter is 575.589.0269, which is the phone for the Red Arrow Flight Training Academy, an active member in both the FASF and EAA Chapter 1570. 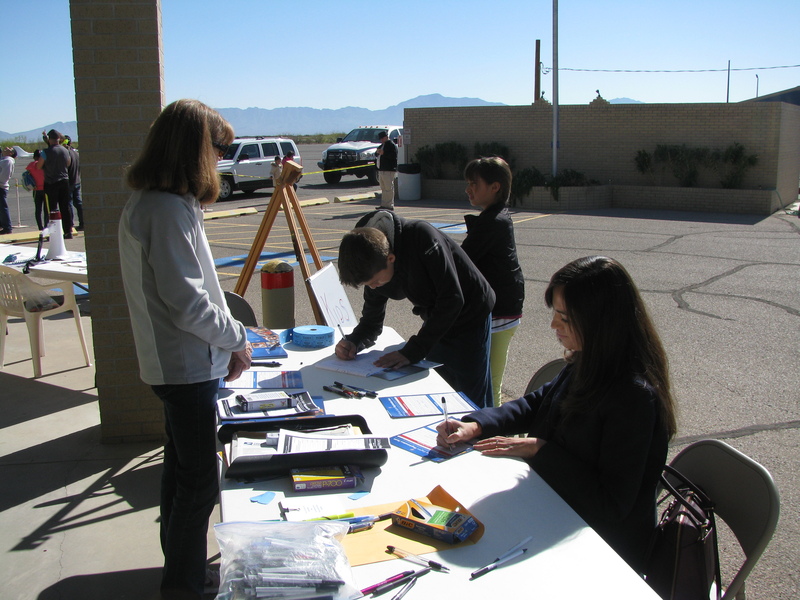 Here are some photos taken at the most recent Chapter 1570 Young Eagles event. 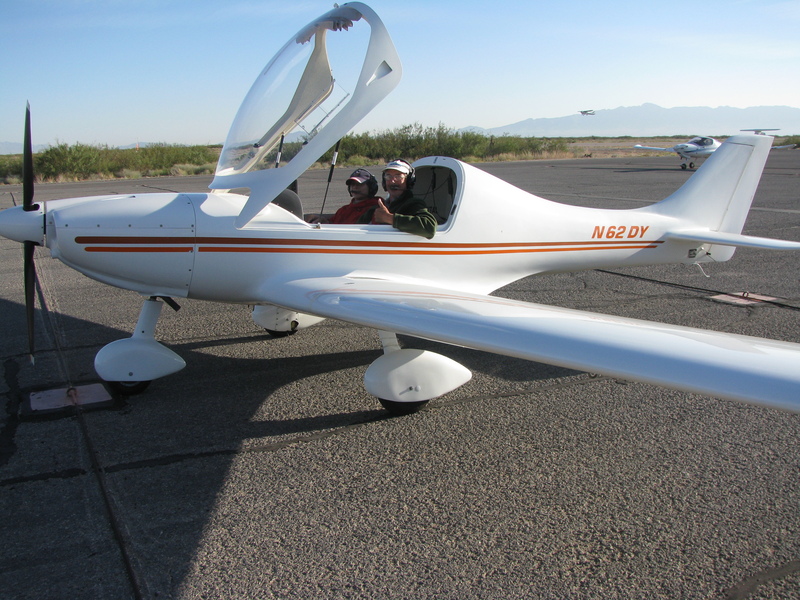 Again, as with EAA Chapter 555, many of the 1570 chapter members are also active members in the FASF. 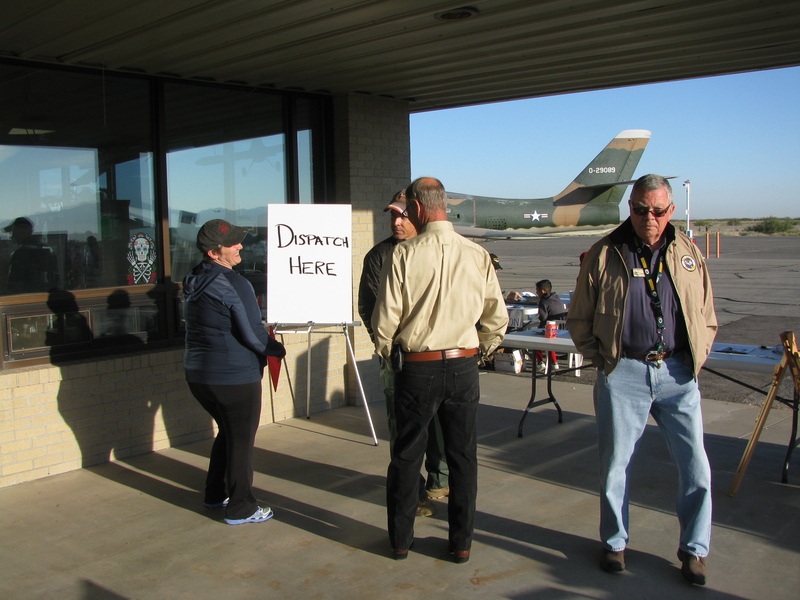 Volunteers Bob Dockendorf, Executive Director of the WAR EAGLES AIR MUSEUM (in background) on the far right, and Deb Rothschild, Rotary Wing and Fixed Wing Flight Instructor, seen at far left, waiting for the Young Eagles event to begin. 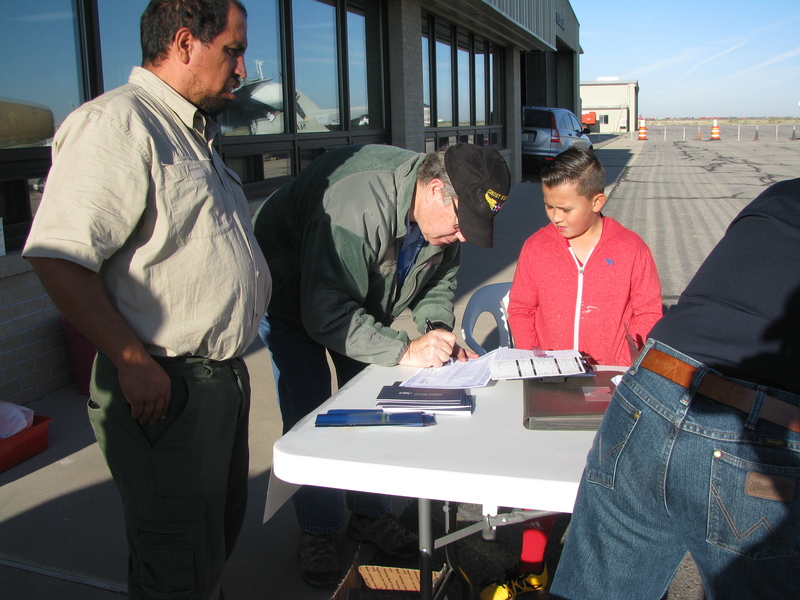 FASF Advisor, Colonel John Orton, signs up a Young Eagle for his first flight. 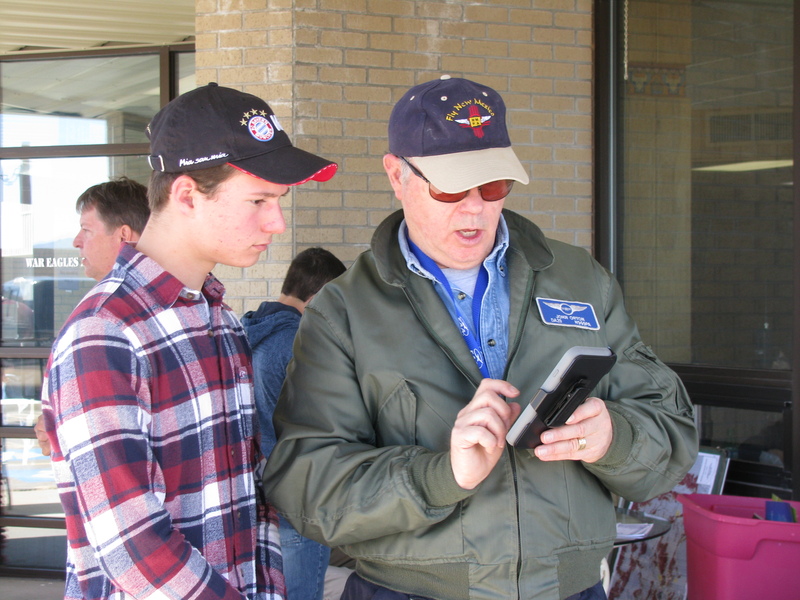 The Colonel shows his Young Eagle how pilots can use hand-held electronic accessories such as his iPad or an android device, to calculate many useful flight parameters, such as ground speed and arrival times . . . 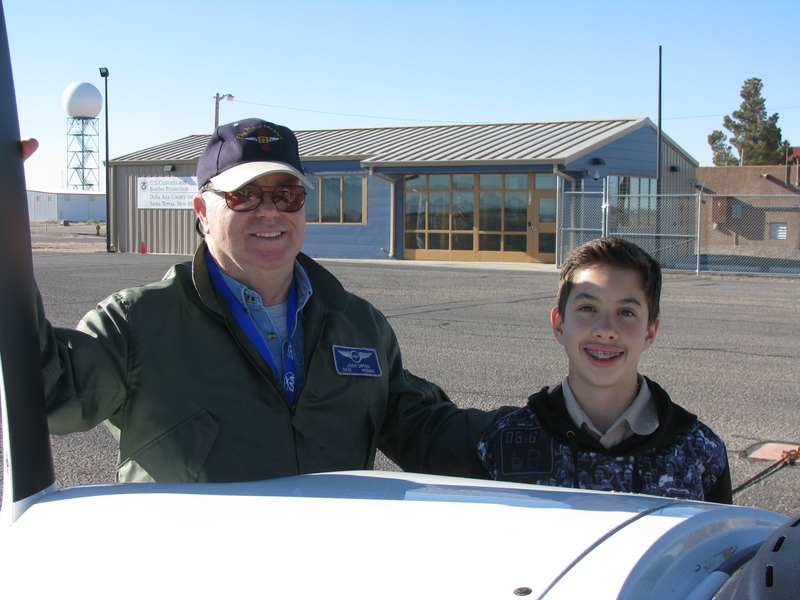 The final step in each Young Eagle’s flight experience is its documentation, including both a new Pilot’s Logbook and a Flight Completion Certificate. 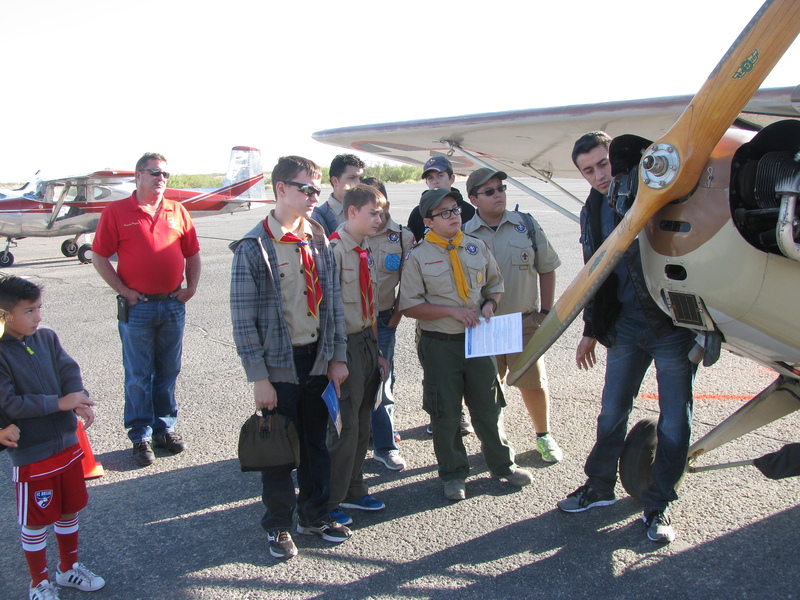 Several Boy Scout Troop members listen to their Pre-Flight briefing by one of the Chapter 1570 Volunteers. They are learning the important parts of the airplane and have the opportunity to learn by asking questions of the Volunteer pilots. Colonel Orton walks his next Young Eagle (and his older sister) out to the young man’s first flight. In the background is part of the WAR EAGLES AIR MUSEUM, which is an active business supporter of the FASF and home to EAA Chapter 1570. Colonel Orton explains to this Young Eagle how the headset works. Colonel Orton makes sure his Young Eagle student is comfortable and his seat belt properly secured. Both Young Eagle and the Colonel are clearly ready for the upcoming flight adventure. 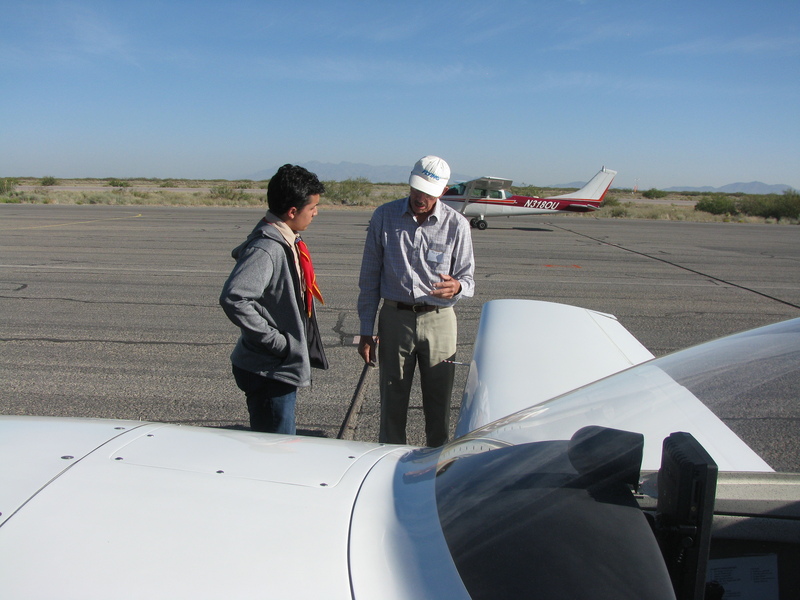 Chapter 1570 President, John Keithly, explains his airplane and its parts’ functions to his next Young Eagle student. 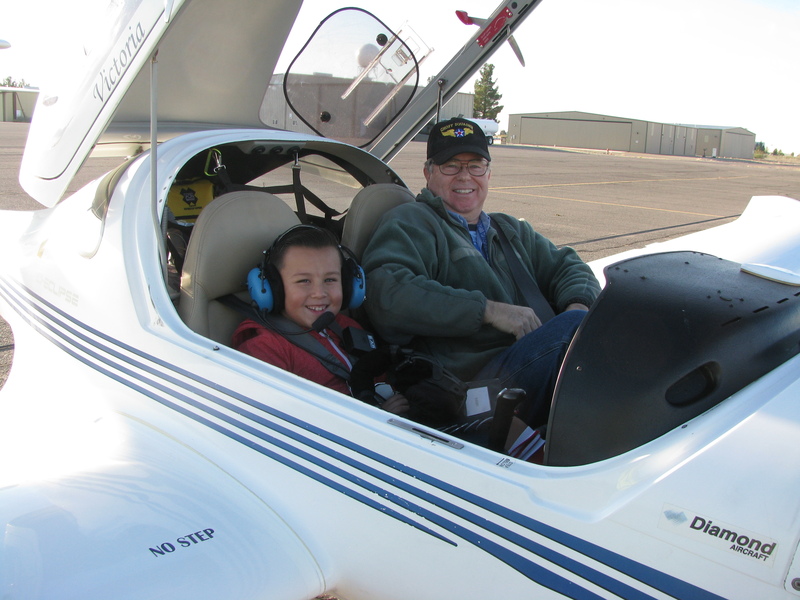 Chapter 1570 President and FASF member, John Keithly, indicates he and his student Young Eagle are ready to fly. Colonel Orton and his Young Eagle taxi out to take off (in the foreground), while John Keithly and his student are seen to the upper right in the background, also taxiing out for take off. 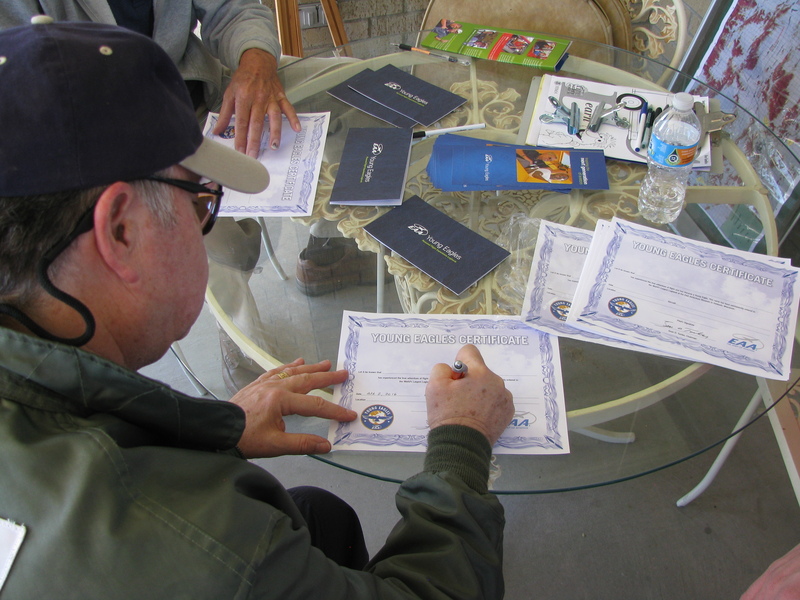 Colonel Orton filling out his Young Eagle’s Pilot Logbook and Flight Certificate after their flight. 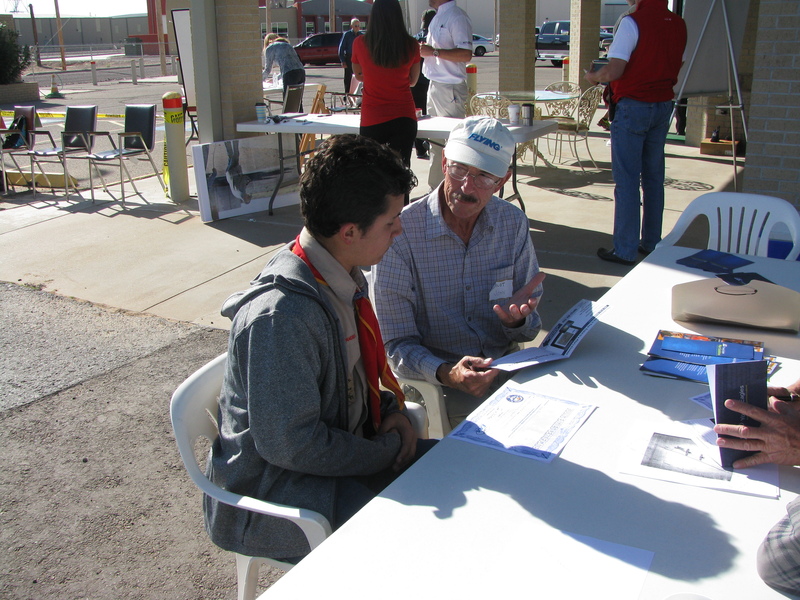 John Keithly (right) debriefs his Young Eagle student after their flight and gives him his souvenir Pilot’s Logbook. 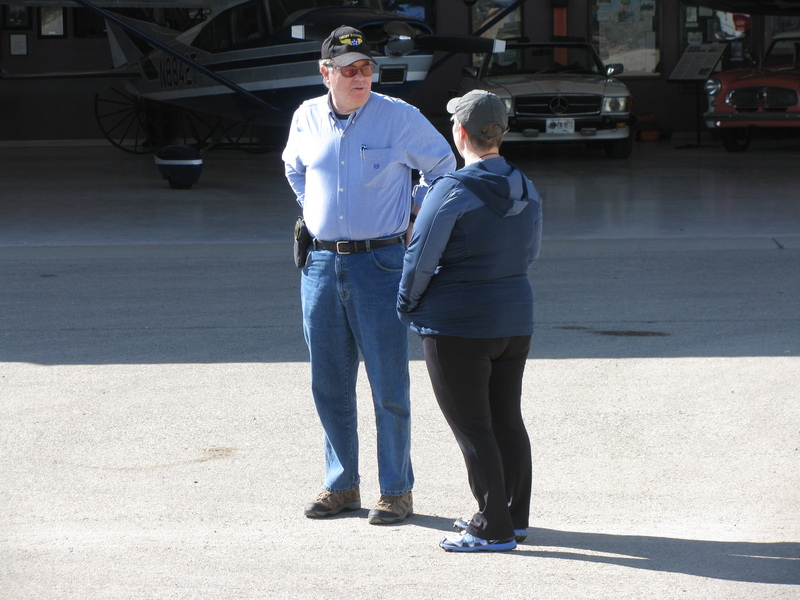 Colonel Orton (L) discusses the event’s success with Flight Instructor volunteer Deb Rothschild (R). 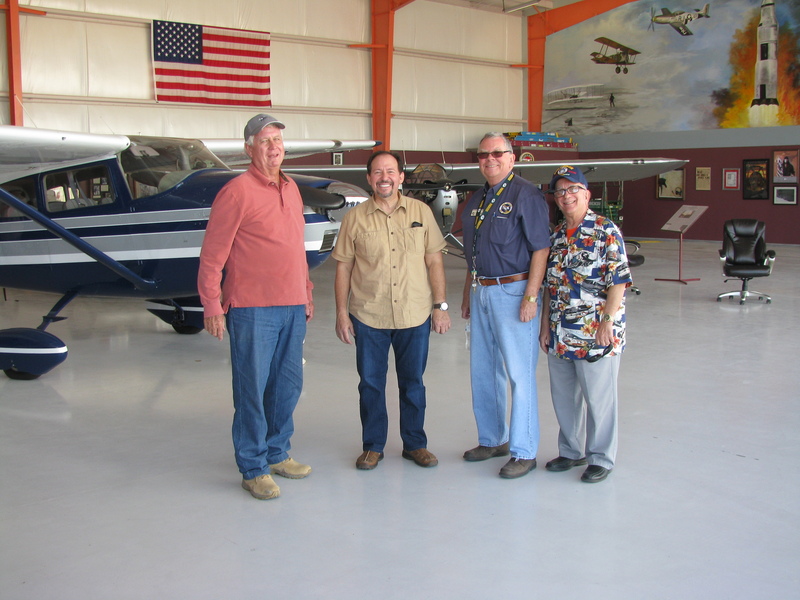 From L to R: EAA members and Young Eagle Pilot and Program volunteers; Mike McNamee (in whose hangar they are all standing); Judge Alex Gonzalez; Bob Dockendorf; and Daedalian Flight Captain and former USAF Pilot, Roger Nichols, pose in readiness for post event celebratory luncheon. This entry was posted in AVIATION NEWS on February 4, 2017 by FASFRIC.